For those who have been promoting Malaysia's green agenda for while now, this is your opportunity to get the recognition you feel you are entitled to. The Malaysia GreenTech Awards 2013 is organised by Malaysian Green Technology Corporation (GreenTech Malaysia) to honour Malaysian-based developers, industry players, financial institutions, primary and secondary schools as well as members of the media that have played a catalytic role in driving the nation’s green agenda. Developer Awards: Development, construction and management of projects, townships or building that have incorporated green technology. Industry Awards: Adoption of green practices in business operations and processes amongst industry players, across sectors. Financial Institution Awards: Financing of green projects and initiatives. School Awards: Instilling sustainable green practices and increasing environmental awareness amongst primary and secondary school students. Media Awards: Advocacy and promotion of nation’s green agenda. The Malaysia GreenTech Awards is endorsed by the Ministry of Energy, Green Technology and Water (KeTTHA) and supported by REHDA, FMM, SIRIM, CETREE and MPI and other sector renowned organisations. The award ceremony will take place on the 12th October 2013 at the Mandarin Oriental Hotel, Kuala Lumpur. The closing date for submission is on 30th August 2013. 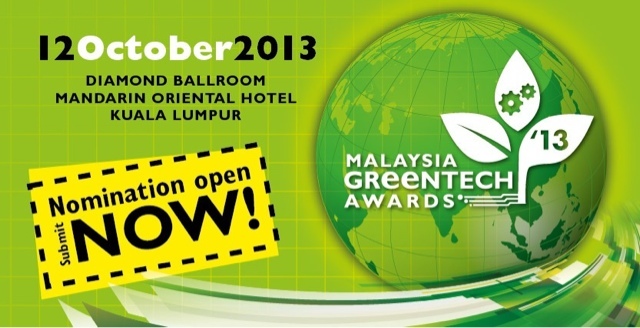 Interested parties can submit their Nominations Form online here, or contact GreenTech Malaysia at Tel: 03-89210806. Cool! I would like to see the efforts by a school in Penampang (SM St. Michael) getting due recognition. They have, for the past few years, continued to promote environmental awareness amongst its students, including installation of the 5.4kWp Solar PV system on its roof.